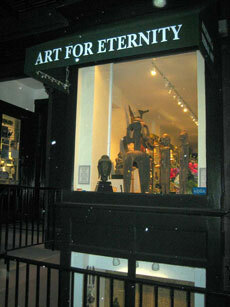 Art for Eternity is a leading New York gallery specializing in Classical Antiquities, Pre-Columbian & Tribal Art. We are pleased to celebrate our 28th year dealing in these areas and pride ourselves on superb connoisseurship, communication and customer satisfaction. We manage collections, buying, selling, and consultation on conservation, mounting, security, and write certified appraisal reports. Howard Nowes, owner and director of Art for Eternity Gallery on Manhattan’s Upper East Side, has been finding treasures and bringing them to collectors for 25 years. His exceptional eye and excellent reputation have made him a go-to source for connoisseurs of classical antiquities, pre-Columbian and tribal arts for decades. Pieces from Art for Eternity live in museums at Yale, Dartmouth, Princeton and Emory—and have been featured in Architectural Digest, The New York Times, CNN and Newsday. A trusted and respected expert, Mr. Nowes organizes an informed collection—affording buyers much-needed security, honest appraisal and ethical pricing and is noted for his ability to distinguish rare and important objects. Please sign up for our newsletter. We will keep you updated as to promotions, sales, exhibitions and news at Art for Eternity Gallery and in the ancient and ethnographic art community. We will never sell, rent or share your personal information, including your e-mail address, with any third parties for marketing purposes without your express permission. Howardnowes.com was inaugurated in 1998 and we have sold thousands of objects to satisfied clients worldwide. Howard was a charter member and former associate of Sothebys.com, a world leader in the auction of fine art collectibles. Howard is a member of the Antique Tribal Art Dealers Association, an organization of honest, informed, ethical professionals affording buyers much-needed security in their consultations and purchases. The ATADA also fosters education for the public and sets high standards for the trade in Tribal Art. Howard holds a Bachelor’s of Arts Degree in History of Art from Skidmore College in Saratoga Springs, NY and has taken art business courses at Sotheby's in London. Howard is a certified member of the Appraisers Association of America, Inc. [AAA]. All Howard Nowes Appraisals are prepared in accordance with the Uniform Standards of Professional Appraisal Practice (USPAP) set forth by the Appraisal Foundation in Washington D.C. and is bound by the strict Code of Ethics of the AAA. Collecting antiquities is a unique passion. Like other collecting pursuits there is the thrill of the hunt, the refinement of one’s ‘eye’, the satisfaction in building up, piece by piece, a good grouping of objects , etc., etc.. But unlike the others, antiquities provide another dimension, which is the palpable connection across the millennia, between ourselves and our distant forbears. Whether it be the act of holding a Greek vase, examining an Egyptian bronze, or handling a replica watches Peruvian textile, there is invariably that crystalline moment when the clear yet ineffable link to its maker gives us pause and inspiration. The urge to maintain this contact is itself an ancient one. Julius Caesar is reported to have collected Etruscan artifacts and in the Song dynasty Chinese collectors avidly sought out already ancient Shang bronzes. At a time when much is said about the need to respect and encourage cultural diversity we can think of no better way to teach our children the unique worth of all the world’s many civilizations, both past and present, than by giving them the opportunity to live in a home ‘populated’ by the handiworks of these distant, yet vibrant spirits. We know that living with art is enriching to the soul and the mind. But living with antiquities goes beyond this. It serves to connect us all as it instructs and enlightens our sense of shared humanity. 11-7 daily but we strongly suggest making an appointment.